Garden Steps Gazebo tapestry shows a bouquet jardin, or a French garden setting of flowers. Here we see a classic setting of ancient urns, columns and a stairway to a garden gazebo with flowers strewn along the way and a red drape symbolizing luxury and elegance, in the foreground as well. 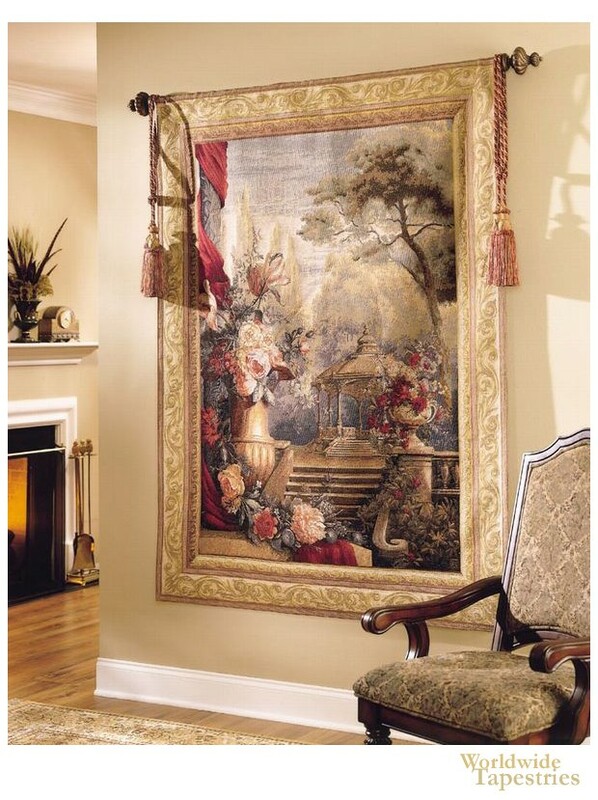 This tapestry shows a scene celebrating the garden and outdoor setting of countryside France, a theme used for wall tapestries since the 18th century, to bring the beauty of nature into the home. The colors are cohesive and well balances with reds and crimsons highlighting the more gentle beiges and greens of the garden foliage and trees. "Garden Steps Gazebo" tapestry is backed with a lining and has a tunnel for easy hanging. Note: tapestry rod and tassels, where pictured, are not included in the price. Dimensions: W 40" x H 55"
Dimensions: W 54" x H 74"